Family Talk Episode Reminder Get a sneak-peek into each new show, delivered straight to your inbox! 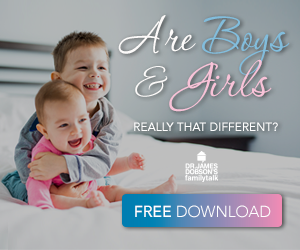 Dr. James Dobson is the Founder and President of Family Talk, a nonprofit organization that produces his radio program, "Dr. James Dobson's Family Talk." He is the author of more than 30 books dedicated to the preservation of the family, including The New Dare to Discipline, Love for a Lifetime, Life on the Edge, Love Must Be Tough, The New Strong-Willed Child, When God Doesn't Make Sense, Bringing Up Boys, Marriage Under Fire, Bringing Up Girls, Head Over Heels and, most recently, Your Legacy: The Greatest Gift. Dr. Dobson served as an associate clinical professor of pediatrics at the University of Southern California School of Medicine for 14 years and on the attending staff of Children's Hospital of Los Angeles for 17 years. He has been active in governmental affairs and has advised five U.S. presidents on family matters. He earned his Ph.D. from the University of Southern California (1967) in the field of child development. He holds 17 honorary doctoral degrees, and was inducted in 2008 into The National Radio Hall of Fame. Dr. Dobson recently received the following awards: Winston Churchill Lifetime Achievement Award from the Faith & Freedom Coalition (2017), Daniel Award from AZ Christian University (2016), and the Defender of Life Award from the Justice Foundation (2015).